Today is a beautiful day @ My Cozy Corner. I retired to my retreat and enjoyed a wonderful breakfast. Blue and White is so restful. I love my blue and white tea pot. The egg cups were my mother's treasures. I love English muffins and yogurt too. I needed some pampering after weeding and pruning. After breakfast I took a nice long nap. My Camellia tree is in full bloom. One more look until next time. Oh my word, Betty - this post is so beautiful! Your camillia is gorgeous - so fresh and lovely, and your tea wares are awesome! You worked hard, you deserved to rest in style. Wonderful post, thank you for sharing! Such loveliness. I have that same teapot and love it. What a pretty post Betty! I adore your blue and white dishes. Thank you for sharing at SYS and have a wonderful weekend! You deserve a breakfast in bed and a nice nap after all that work in the garden. I am olden also and it's becoming harder and harder to do the gardening. I am sure your garden will be spectacular very soon. I love this!! It looks so relaxing... I never eat breakfast in bed because, um, I'm messy and dribble. The camellias look so pretty with the blue! I think I could handle that breakfast experience too! I love your restful ideas, but never would I have breakfast in bed. Not my style. Love it. Worth every stray crumb. and the teaware is VERY nice. A cosy, calming space. All that's lacking for me is something pleasing to read. This is so beautiful, Betty! I'm going to highlight this post next week for the Hop. I'm only a little envious of you being able to work in your garden. I'm sooooo ready for spring. This winter has been a nasty one with more ice than snow. I'm also a fan of eating in bed. My grandmother would be mortified. Ha, ha. I admire your level of energy, Betty. I need to get into the garden too, but haven't. I did have some help recently to prune and feet the roses, so at least that is done. Will be time to put some annuals out soon. It is definitely feeling like spring here in central TX. Your breakfast tray is so pretty. I like the idea! This is lovely Betty. So soft and romantic too, crumbs and all....LOL You have lots of energy to work in the garden. It always pays off. Thank you for linking up to Dishing It & Digging It. Have a lovely week. What a lovely bedroom with the tray all ready on the bed - time for a "retreat" breakfast. I think all the blue transferware is so pretty. Glad you shared! What a beautiful room to relax in! I love the blue and white dishes and how you make time for yourself, well done. We would love for you to share this at Celebrate Your Story link party. Here is where you link up: http://www.thesweetsensations.com/celebrate-your-story-link-party-is-moving/. Hope to see you there and have a restful week! Beautiful! 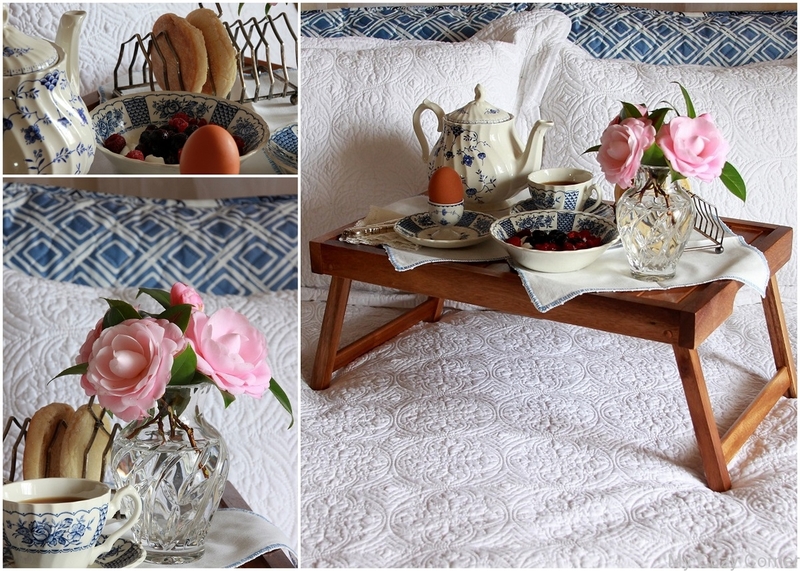 How I'd love to be pampered with a breakfast in bed like yours. What a lovely spot to retreat to, Betty. Your blue and white is so restful and I love your tea tray with the blue and white and the gorgeous vase of camellias! Just lovely! Thanks for sharing and enjoy that garden! Betty it is just perfect! Love the soft blues and whites. I just want to take a nap in that room. Great job! Oh this is fantastic. I love your toast rack! Thanks for sharing at Home Sweet Home! This is truly a 'cozy corner!' This looks so inviting, relaxing, and just lovely!